Canadian astronaut Cmdr. Chris Hadfield is excited about the moment when the Soyuz rocket he is travelling aboard bursts through the atmosphere and begins its rough parachute ride back to the Earth's surface. Hadfield, the current commander of the International Space Station, blasted off for the ISS on Dec. 19, and his return is expected around May 13. Hadfield has been to space before, but the return trip a few weeks from now will mark his first journey home aboard one of the Russian rockets used by NASA since the U.S. shuttle program was abandoned. Hadfield will pilot the Soyuz as it comes home. "I'm excited about the landing, I've flown twice in space before, but on a shuttle. The shuttle kind of flies its way into the atmosphere and picks up on wings and lands," he told a school group Monday from the ISS. "The Soyuz comes in a little more meteorite-like and opens a parachute and we come down and we let the Earth know we're back, the Soyuz hits with definite force when we land... It's something I've trained for for years including learning to speak Russian. So that part, I'm really excited for." Hadfield took over command of the ISS on March 13, becoming the first Canadian to run the massive orbiting research station. During his mission Hadfield has conducted experiments, repairs and installations and taken hundreds of stunning photographs of the Earth, posting them to Twitter where he now has close to 700,000 followers. As the end of his mission draws near, Hadfield said he is becoming "wistful" as he conducts various tasks aboard the ISS -- some for the last time. And as the days tick down he said he is spending more and more of his limited free time gazing out the window at Earth "because of the magnificent rarity of it and my desire to absorb as much of it as I possibly can." Hadfield said he is excited about some aspects of returning home. In addition to seeing family and friends, he's looking forward to eating food that has smell and texture and doesn't come served in a bag. 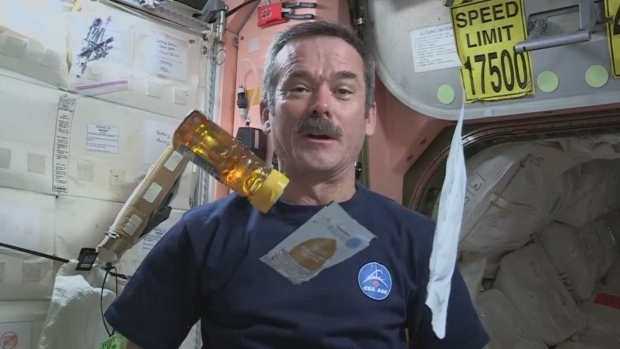 "I'm looking forward to fresh food and the crunch and the snap of food of all different varieties and the smell of rich coffee and the smell of fresh bread baking -- that type of thing, a more full assault of the senses when I get home," Hadfield said. Hadfield said his emotions swing between feelings of great responsibility and great honour to have been asked to command the space station, and he wants to "do it right," making the most of his experience and communicating to as many people as possible on Earth. "Yes, it's a feeling of responsibility, but at the same time it's a real feeling of honour that you've gotten to a point in life where you're trusted to do this," he said. "You do feel the responsibility of it to try and do it right, to try and have one perfect day on the station where I don't make even one little mistake in any of the procedures, and I haven't done it yet. I've been here 130 days and I have yet to have day where I haven't made at least one little small mistake."